When Obama was in the White House, the safest place for young undocumented immigrants was in the public eye. Vargas’s detention shows that’s no longer true. Despite dangling the possibility of immigration reform before the nation this week, the Trump administration continues to show exactly what its immigration intentions are where it matters most: in the streets. On Tuesday, Immigration and Customs Enforcement agents in Jackson, Mississippi, pulled over and detained 22-year-old Daniela Vargas, who had just finished participating in a press conference where she spoke out about her family’s recent detention and her concern for her own safety. Her fears were particularly acute because her short-term deportation deferral had recently expired. Vargas has joined a raft of other undocumented immigrants who would have been left alone by the Obama administration and now find themselves in the crosshairs of the federal government. Vargas, a recipient of President Obama’s Deferred Action for Childhood Arrivals, had been explicitly granted a short-term protection from deportation. (She and others who qualify for DACA are known as DREAMers, for the proposed Development, Relief, and Education for Alien Minors Act.) Vargas is not the first DREAMer to get picked up in the new Trump era—23-year-old DREAMer Daniel Ramirez Medina was detained in the Seattle area and remains in custody. A San Antonio 19-year-old DREAMer named Josue Romero was also detained last month, but was released on bond. But Vargas’s case is important for other reasons. When Obama was in the White House, the safest place for young undocumented immigrants like Vargas was in the public eye. Declaring one’s immigration status provided a kind of political protection from being seized by immigration agents. The federal government was sensitive to being publicly shamed for pursuing the “wrong” undocumented immigrants for removal. What Vargas’s detention shows is that those days are over. The Trump administration is upending the unspoken norms of how the federal government will deal with undocumented immigrants. The once-safe places do not exist as such anymore. Those who were once the most sympathetic immigrants now join millions of other undocumented immigrants as the new targets. Depending on whom you talk to, “DREAMer” can be a demographic descriptor, a social identity, a political constituency, or all of the above. 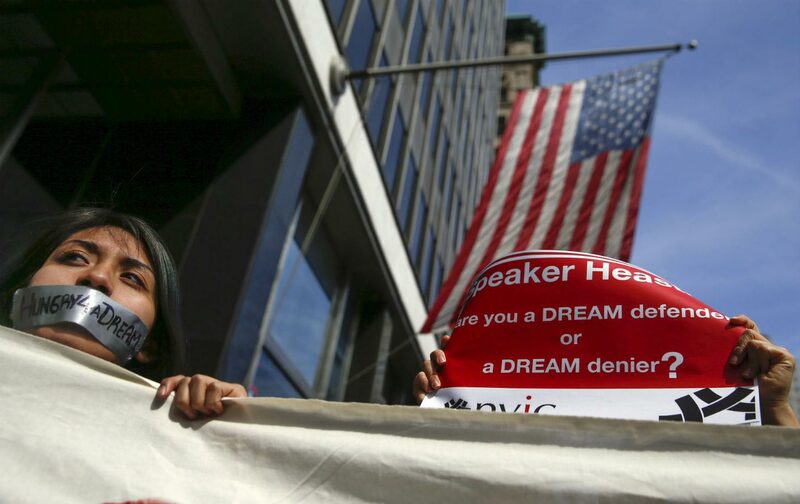 DREAMers themselves created the identity in the late 2000s in the run-up to what would eventually be the narrow defeat of the 2010 federal DREAM Act. Had it become law, the DREAM Act would have allowed undocumented immigrants who came to the United States as children and who cleared a host of hurdles to pursue legal status and even citizenship. DACA, by contrast, granted only revocable protection from deportation. While the DREAM Act eventually failed, undocumented immigrants were able to use their new political clout to shame the Obama administration with deportation-defense work, publicizing sympathetic cases and urging supporters to flood ICE and elected officials’ phone lines with calls for the release of detained undocumented immigrants. And often, that worked. But it did so mainly because the Obama administration was trying to have it both ways—Obama publicly espoused a compassionate attitude toward immigrants and pledged to focus deportation efforts on criminals. Meanwhile, his enforcement agencies often arrested the very immigrants the administration said didn’t warrant immediate removal. In those years, undocumented immigrants repeatedly told me that “coming out,” as declaring one’s status publicly came to be known, was actually a safer move, because at least their neighbors and coworkers and friends and fellow churchgoers could know and then help wage a public campaign to support a person should they get caught up in the immigration system. It was hiding in the shadows that put a person at greater risk of being deported. But Obama is not the president anymore. And while we’ve already seen just how important political protest is in the Trump era, Trump’s executive orders on immigration have explicitly liberated ICE agents to pursue any and every undocumented immigrant. This is the reality—despite Trump’s wishy-washy public statements about DREAMers, whom he’s said he’d deal with “with heart.” The Trump administration has yet to dismantle the DACA program, which exists at the discretion of the president. It is one of Trump’s immigration campaign promises that he’s actually held off on fulfilling, and it’s one of the easiest programs to dismantle. Yet Trump’s executive orders, the recently released implementation memos from the Department of Homeland Security, and Vargas’s arrest show that DREAMers should consider themselves vulnerable. At the press conference on Tuesday, Vargas spoke out about the detention of her father and brother two weeks ago on February 15. Vargas was asleep inside her family’s home when ICE agents stopped her father, Daniel Vargas; and her brother, Alan, as they were on their way to work and arrested them. Fearing for her own safety, Daniela locked herself in the home and barricaded herself inside a closet. ICE agents paced around outside her home for five hours trying to persuade her to come outside. They got a search warrant, surrounded her home, and eventually broke into her family’s home, says Bill Chandler, executive director of the Mississippi Immigrant Rights Alliance, who was called to the Vargas family home as the raid was under way. ICE released her after she showed them that she was a DACA recipient, but, Chandler says, not before threatening her. “They said they were going to come back and get her,” Chandler says. And on Tuesday, they did. Vargas was in a car driven by a friend after leaving the press conference when they were pulled over by law-enforcement officers who turned out to be immigration agents. The agents reportedly told her that they knew who she was, and that she ought to know why they stopped her. “I continue to fight this battle as a DREAMer to help contribute to this country which I feel very much is my country,” Vargas said on Tuesday just before she was detained.